These ratings can’t be correct, according to the President himself the US is hitting its highest peaks it’s seen in years. A majority of voters in 12 states approved of Trump’s job performance, while a majority disapproved in 27 states. Trump’s best numbers came in Wyoming and West Virginia; his worst numbers were in the District of Columbia and Vermont. Record numbers of Democrats and independents disapproved of Trump in January. At the start of a new period of divided government and amid the longest government shutdown in U.S. history, President Donald Trump’s popularity found a new floor in January. In the latest data from Morning Consult’s Trump Tracker, which measures the president’s approval rating in all 50 states and the District of Columbia, a record low of 40 percent of voters approved of Trump and a record-high 55 percent disapproved, resulting in the worst monthly net rating of his presidency. The latest data is based on 156,104 surveys conducted Jan. 1-31. 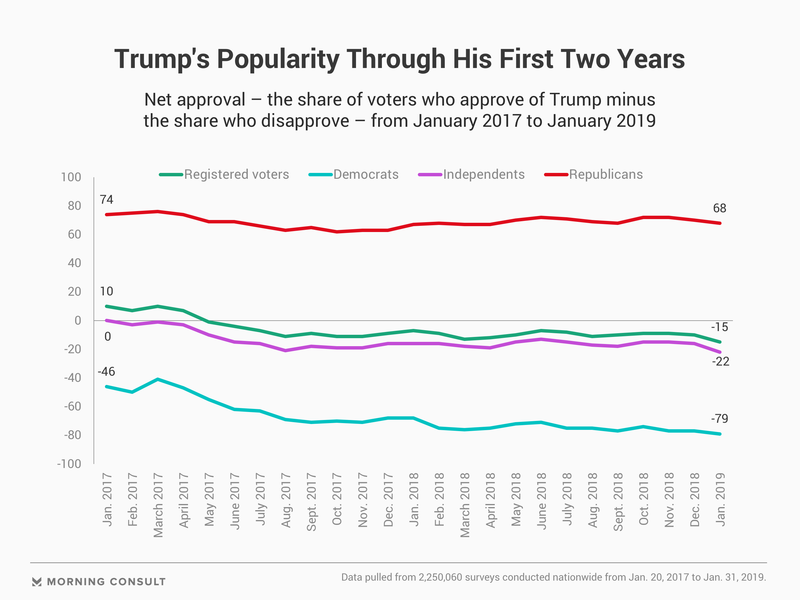 The nadir was largely fueled by record opposition outside of the president’s base: 88 percent of Democrats and 56 percent of independents disapproved of Trump during the first month of 2019, the most of any month since his Jan. 20, 2017, inauguration. Trump’s base remained fairly solid, with 83 percent of Republicans approving of the president. But that share of support among Republicans was its lowest since September, when Washington was roiled by the Supreme Court confirmation proceedings for Brett Kavanaugh. The poor national marks were reflected at the state level. A majority of voters in just 12 states approved of Trump’s job performance, all of which were red enclaves spanning from Wyoming to Alabama. The president retained support from a plurality of voters in five other states he easily carried during the 2016 election: Alaska, Indiana, Kansas, Montana and North Dakota. But another state that Trump won, Nebraska, was split. 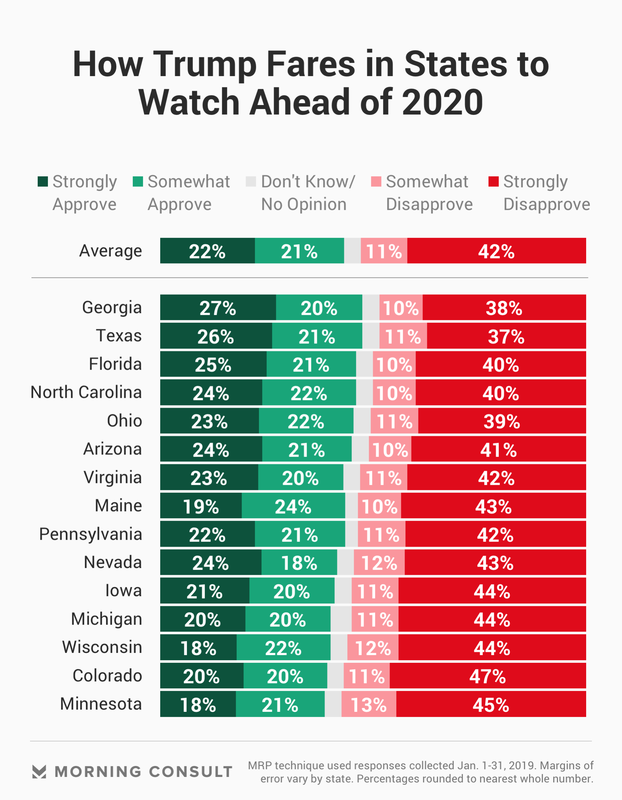 Trump’s net approval rating was underwater in 32 states, including 15 that experts said were worth keeping an eye on ahead of 2020. A majority of voters in 27 states disapproved of Trump’s job performance in January, including Pennsylvania (53 percent disapprove), Michigan (55 percent disapprove) and Wisconsin (56 percent disapprove), all of which were pivotal to his Electoral College victory over Democrat Hillary Clinton in 2016. A plurality of voters disapproved of the president in four states, including perennial swing-state Florida (50 percent disapprove) and Georgia (49 percent disapprove), where Democrats have grown more competitive in recent years amid shifting demographics and the growth of the Atlanta metro area. Without rounding, Trump was 1 point in the red in Texas, another state that has proven kinder to Democrats in the past two election cycles, as well. The president is also underwater by double digits in Colorado (minus 18 points), Iowa (minus 14 points) and Maine (minus 11 points), states that could prove stiff competition for Trump and Senate Republicans next year. In all, the January data shows Trump’s net approval declined in 43 states and increased in four: Idaho, Louisiana, Georgia and New Mexico. The biggest slide came in New Hampshire, the traditional holder of the first-in-the-nation presidential primary. Nearly six in 10 Granite Staters (58 percent) disapproved of Trump in January – up 6 points since December – while 39 percent approved, down 4 points since the prior month. Trump’s January approval was worst in the nation’s capital, the seat of the federal government he shut down over his proposed wall on the U.S.-Mexico border. Eighty-one percent of Washingtonians disapproved of the president, while 16 percent approved. The state closest to matching the District of Columbia’s disapproval figures was Vermont, where 66 percent disapproved and 31 percent approved. His best numbers came in Wyoming, where 63 percent of voters approved of him, and West Virginia, where 60 percent of voters approved of him.